With a backlog of 14 missions worth more than $1 billion, International Launch Services has up to a half-dozen commercial Proton rocket missions planned this year as the U.S.-based firm fills its manifest for 2015. Counting commercial and government flights, the Russian Proton launcher has up to 12 missions scheduled for 2014, according to Karen Monaghan, an ILS spokesperson. The Proton's first launch is scheduled for Feb. 14 with the Turksat 4A communications spacecraft, which arrived at the Baikonur Cosmodrome in Kazakhstan on Friday after a transport flight from its satellite manufacturing facility at Mitsubishi Electric Corp. in Japan. 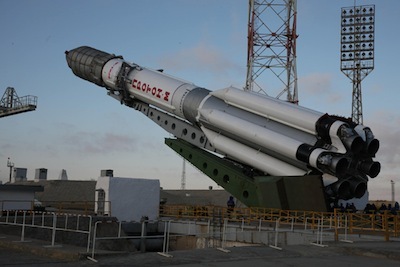 A slate of commercial and Russian government missions are queued up after Turksat 4A, launching Russian civil telecom satellites, the Luch 5V data relay satellite to serve the International Space Station, a trio of Glonass navigation platforms, and payloads for leading global operators based in Europe, North America and Asia. The Proton is coming off a year marred by a fiery launch mishap in July 2013, when improperly installed yaw angular rate sensors fed bad information into the rocket's flight computer, causing the 19-story booster to lose control almost immediately after liftoff and crash in a toxic fireball near the launch pad. The investigation did not halt Proton missions for long, and the workhorse rocket returned to flight in late September, accomplishing five successful missions before the end of 2013. This spring, engineers from Proton contractor Khrunichev State Research and Production Space Center will introduce modifications to the Proton its Breeze M upper stage to raise their lift capacity to geosynchronous transfer orbit by 200 kilograms, or about 440 pounds. Geosynchronous transfer orbit is the drop-off point for communications satellites launched by the Proton rocket. Communications satellite use their on-board engines to reach their final operating posts 22,300 miles over the equator, where the spacecraft appear to hover in a fixed location in the sky. With the so-called "Phase 4" upgrades coming online this spring, the Proton/Breeze M will be capable of lofting 6.35 metric tons, or 14,000 pounds, to such an orbit. Approximately 50 percent of Khrunichev's revenues in the last decade have come from comercial Proton launches arranged by ILS, which is wholly owned by the Russian aerospace contractor. The July 2013 launch failure came after a series of anomalies in the last few years primarily caused by shoddy workmanship. None of the Proton's customers have defected to other launch providers. Most of the Proton's commercial payloads are too massive to fly on SpaceX's Falcon 9 rocket, and Arianespace has an overfilled launch manifest this year with too many payloads and too few Ariane 5 launch opportunities. ILS last week identified two payloads to be added to the Proton's launch schedule in 2015. One of the payloads is the Intelsat 31 satellite, also known as Intelsat DLA 2, to expand DirecTV's direct television broadcasting service to Latin America. The payload assignment comes from a contract signed between ILS and Intelsat in March 2013. ILS also announced it will launch the Eutelsat 9B communications satellite, which hosts a package for the European Space Agency's European Data Relay System to transmit signals between ground stations and spacecraft in low Earth orbit.